Auditions for “Zombies, Werewolves and Aliens, Oh My!” are on February 13th and 14th between 6:30 and 8:00 at the Cedar Springs United Methodist Church. 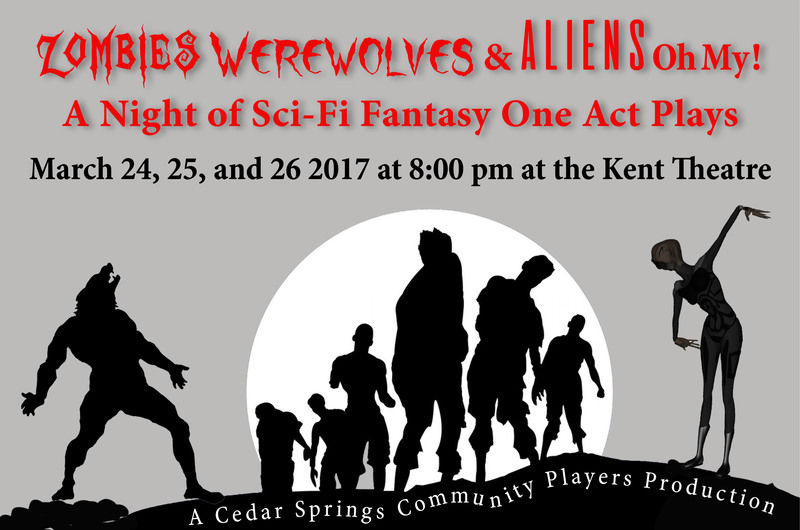 The Cedar Springs Community Players will be presenting three Sci-Fi Fantasy one act plays on March 24, 25, and 26th at the Kent Theatre. “Zombies, Werewolves and Aliens, Oh My!” kicks off the 2017 Fantasy themed season. The three short comedies are set in the old west, modern day suburbia, and outer space in the future and feature hilarious encounters with an assortment of monsters and aliens. People have always loved stories about monsters. Our literature is full of entities with mysterious origins with great strength or different abilities that we must somehow overcome. Traditionally, this is done with fierce battles and intestinal fortitude on the part of the hero. And since conflict is a great plot device, these stories about monsters have long been a part of our film and theater history, too. Mary Shelley’s “Frankenstein, or the Modern Prometheus” was published in 1818 and she is known to have seen a play based on it in 1823. And this popularity endures – in 2016 there was even a Frankenstein ballet. And you can expect to see a fair amount of “cheesiness” and comedy on stage in March. We have a lot of roles to fill – both actors and monsters – in these three plays and would love to see you at auditions. And if you enjoy monster makeup, exotic costumes, know how to make a convincing looking ray gun or other things out of tin foil, please let us know! Auditions for the show are on February 13th and 14th between 6:30 and 8:00 at the United Methodist church. If you are interesting in helping out behind the scenes, please feel free to come to the auditions and introduce yourself or send us an email at contact@cedarspringscommunityplayers.org. This is going to be a fun show and we want you to be a part of it!